Cord Kiessling steps up for Taos' oldest brew pub. Night of the Puppetistas: coming July 31st to Taos Ale House. 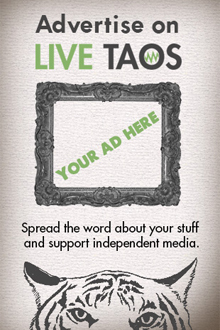 Join the LiveTaos Cinema Circle -- what movies have you seen lately? Jim Gilbert follows up his microwave odyssey with a milk odyssey. Nice Piece! features uncommissioned public art in Taos. For a town full of great musicians, Taos doesn't have much of a blues scene. Jackson Price aims to change this with a new weekly Taos blues night at the TMB.